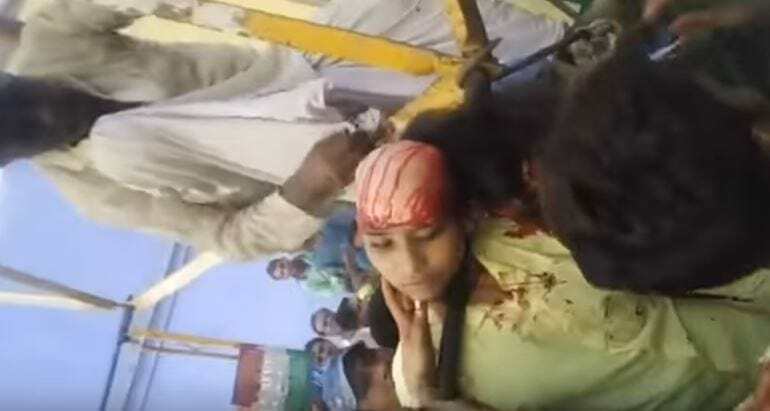 This is the stomach-churning moment a teenage girl in India was scalped after her hair got caught in the mechanisms of a ferris wheel. The girl was stood in front of the wheel and was trying to take a selfie, but apparently she was stood too close to the ride and her hair got tangled in the mechanisms, resulting in her scalp being literally ripped from her head, reports CW33. The above video shows the immediate aftermath of the accident as strangers try to untangle the young girl’s hair and console her despite the crippling pain. It makes for quite the harrowing watch. Apparently when her hair got snagged on the ride the ferris wheel wasn’t able to stop and continued moving upwards for a short while, dragging the girl with it. The incident happened in the city of Baraut, in the Baghpat district of Uttar Pradesh. The 16-year-old was sent into shock due to the unimaginable pain, but is now recovering at a nearby medical facility. Ferris wheels are reportedly set up across all of India at the minute due to the Hindu holiday of Dussehra – celebrating the triumph of good over evil.